The local inhabitants of old Watertowne have created much controversy among the scholarly professionals who have made it their business to research local legends and tales. The natives of this quiet little town have become lately restless. Strange whisperings among the more decadent and degenerate of their kind have indicated that a beverage, based upon an old recipe torn from the pages of some dark tome, has found its way onto shelves of numerous liquor stores. In the hills of New England, various tribes of primitive man were known to cavort during the month that we know as October. Under the light of the dead moon, they would quaff deerskins brimming with an ale that was known to pierce the veil of their own understanding of how the mechanics of the universe function. During this time, when the skin of the world becomes transluscent and we can see through to the underspires of some other fantastical, cyclopean realm that beggars all rational thought, they would drink deep and see into the minds of the Old Ones. It is with some hesitancy that I commit my own findings to the written page. I hesitate only because I know that I will only impel others to seek out what I myself have found and rob me of what appears to be a limited supply of this dark brew. I found Narragansett’s Innsmouth Olde Ale, on display between two pumpkin ales. My hands trembled as I reached toward it and I felt my mind retreat in upon itself. I knew not what happened then, only that I found myself back in my apartment, the six cans in my fridge and the pervasive odor of the sea clung to my garments. I poured the can into the glass bearing the label of a lost and forgotten brewery. It is an amber-deep color, and smells of sweet fruit, reminiscent of cherries. There is a powerful amount of flavor, without it being overwhelming, reminiscent of a doppelbock. There are non-euclidian notes within, complexities upon complexities, and it does not do one well to drink quickly. This is a beer to be enjoyed slowly and with great care and respect for the unendurable and immortal powers that created it. 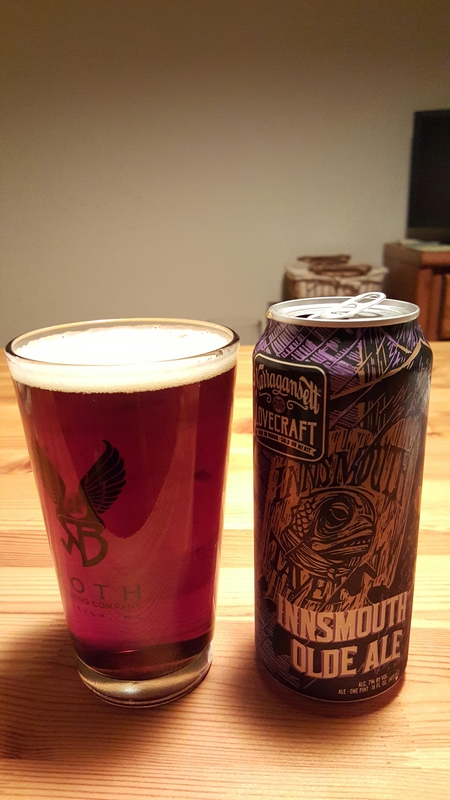 In a season replete with the intoxicating spices of pumpkins and the simpler, cleaner flavors of the Octobfest beers, “Innsmouth Olde Ale” is a refreshingly different alternative while still invoking the season in multiple ways, from its deep and hearty flavors that stave off the oncoming chill to the evocative can design. I would give this beer five R’lyehs and the utter loss of my sanity instantly upon viewing the label.